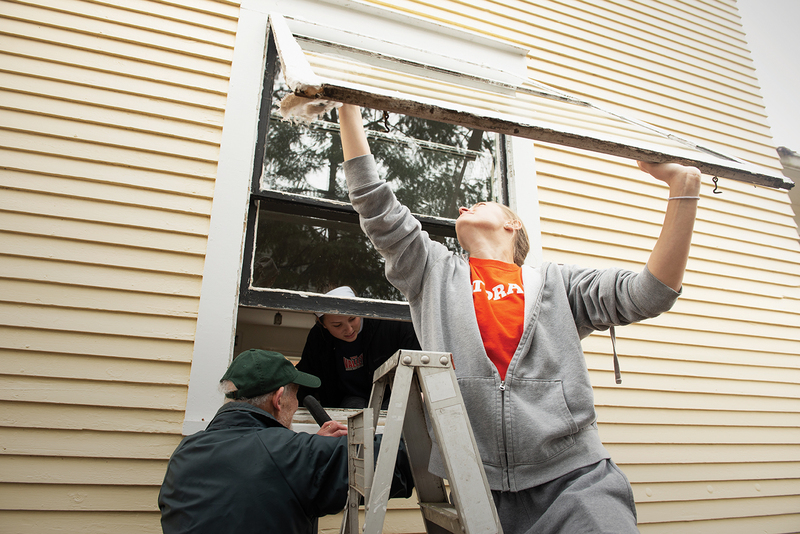 Last April, more than 170 students spread out across Bloomington-Normal to lend a hand to residents and community organizations for the 10th annual Bring It Back to Normal. You can’t say Illinois State students don’t give back to their college town. 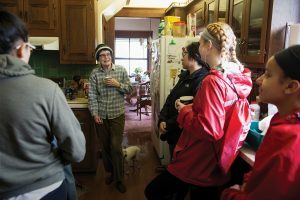 They proved that once again on a cold, gray Saturday morning last April, when 177 students pulled themselves out of bed to lend a hand to residents across Bloomington-Normal. The volunteers cleaned windows, raked leaves, planted trees, prepared gardens, and took care of an assortment of other spring-cleaning chores for their neighbors. The occasion was a special day of volunteer service called Bring It Back to Normal. For the last 10 years, this event has been one of the principal ways students have shown their gratitude to the town they call home for at least nine months of the year. The successful program started out of the Dean of Students Office and is now sponsored by the Center for Community Engagement and Service Learning. 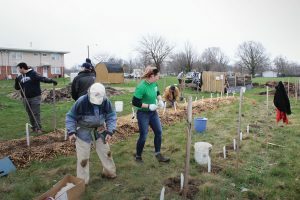 Each spring, Bloomington-Normal residents and community organizations sign up as volunteer sites for the event, listing what task they want completed. Then one Saturday morning in April, student volunteers are split into teams and sent to do whatever needs to be done. Harriett Steinbach, the center’s assistant director for service learning, has helped organize Bring It Back to Normal since its inception. Illinois State created the program as a vehicle to build goodwill between permanent Normal residents and students and modeled the initiative on Texas A&M University’s long-running “Big Event,” Steinbach said. “We know Illinois State students are great; we know all the awesome things they do. But we know that the 1 percent who are loud in the middle night or throwing beer bottles in someone’s yard as they are walking home create a bad impression,” Steinbach said. “When you interact with someone on an individual level, you break down these stereotypes. 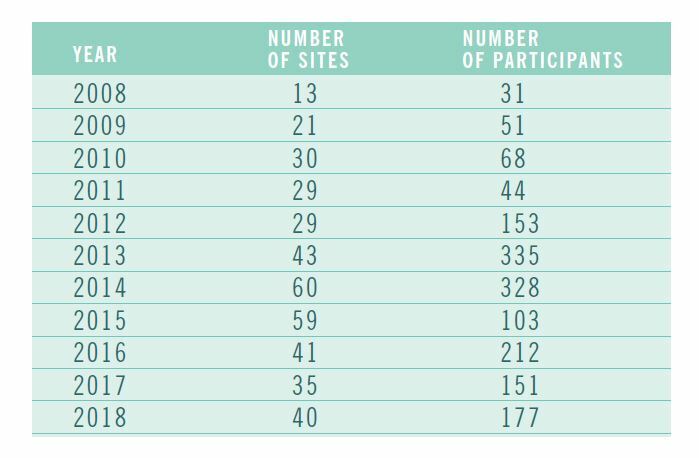 A breakdown of how many students and sites have participated in Bring It Back to Normal since the event’s inception. Bring It Back to Normal has grown dramatically since 2008 when there were only 31 volunteers and a baker’s dozen of sites. Now the event draws more than five times as many volunteers to three times as many sites. Over the program’s lifetime, 1,500 volunteers have provided over 4,000 hours of service. Many residents, like Judy Scott, have been with the program since the beginning. Over the years, students have painted Scott’s storage unit, picked up pine cones, and raked her yard. The volunteers have been a big help to the elderly residents who live in her Fell Park neighborhood, just northeast of campus. Redbird Impact magazine tagged along with the volunteers at this year’s event, held April 14, to get a glimpse of how residents and students experience Bring It Back to Normal. While campus was still rubbing the sleep out of its collective eyes, Bring It Back to Normal kicked off inside the Bone Student Center. Outside, the weather was like Seattle in November: gray, rainy, and 41 degrees. Inside, the Prairie Room hummed with energy as a couple hundred students registered for the approximately three-hour service commitment. They appeared perky in spite of the weather and considering the hour and the day. Event organizers stood out in their green Bring it Back to Normal T-shirts; Greek letters and organizational names identified members of various student groups in attendance. And with that, the students lined up to pick up work gloves and headed to their sites. First stop, for me, was the home of Professor Emeritus of Physics Juergen Schroeer and his wife, Meredith, who taught English at Illinois State and Illinois Wesleyan universities. They live on Normal Avenue a few blocks north of campus in a part of the Old North Historic District with quaint brick roads and homes dating to the 1920s and 1930s. The neighborhood has that classic college town feel. When I arrived, Redbird soccer players Kate Del Fava and Angela Widlacki were busy washing the couple’s 25-plus windows. “Our backs aren’t quite what they used to be,” Meredith Schroeer said. Redbird student-athletes Kate Del Fava and Angela Widlacki clean the windows of the Schroeers’ home during Bring It Back to Normal. The Schroeers have participated in the program since the beginning. For the students’ trouble, the couple usually gives them pies—and sometimes a tip about home-cleaning. A couple years ago, a group of fraternity brothers couldn’t believe you could wash windows with water and vinegar and didn’t need a fancy solution. The students were enjoying the experience as well. “Love being part of the community,” Del Fava said. Widlacki said the service was a great way to repay the community for its support of the soccer team and to bridge the gap between town residents and college students. “They do so much for us,” she said. A group of five students, including members of the Association of Latin American Students, crowded into Giles’ kitchen. Rain had temporarily delayed their plans to work on her garden. Giles, like other residents I interviewed, mentioned how the relationship between the town and the students has improved dramatically over the last few decades. Bring It Back to Normal has only helped matters, they said. Things have not always been rosy between “Town and Gown,” despite the University sharing a founding father (Jessie Fell); at one time, the name “Normal”; and in many ways, a common fate with the town. The late-1960s and early 1970s witnessed cultural clashes as enrollment skyrocketed, activists clashed with a conservative town administration and population, and black students arrived en masse to an area only just then relinquishing its segregated past. While violence was rare, things could get out of hand, like during the infamous “flagpole incident” when the Illinois State Police had to be called to the Quad to stave off a pending riot between locals and students. Things have mellowed considerably since then, though more students than ever live off campus. An estimated 10,000 students reside in the community, mostly within the historic districts that ring campus. A boom in student apartment construction has added 2,500 beds since 2008. Judy Scott credits a more respectful student body and changes in town laws for the better relations. Linda Giles shares tea and talks to the students who came to help her with some gardening chores during Bring It Back to Normal. Giles lived among students for 20 years on School Street. She remembered one hard-partying house that the town ended up buying. Her neighbors are now more likely to be faculty and staff. The tea-sipping students at Giles’ home saw Bring It Back to Normal as an opportunity to get to know their new hometown. “You think campus as being your home, not the town. But this is my home,” said sophomore Lindsey Brown. Just past a public housing complex, in the shadow of a Cargill soybean mill, Illinois Street abruptly ends in a field. An Illinois State student has transformed this once vacant space into an oasis of sorts on Bloomington’s west side. This part of town, like many poorer neighborhoods, lacks a full-service grocery store. Colleen Connelly attempted to remedy this “food dessert” by creating the Sunnyside Community Garden and Food Forest three years ago, while in high school. The garden has steadily expanded and now provides food to low-income families through the nearby Boys & Girls Club of Bloomington-Normal and Home Sweet Home Ministries. 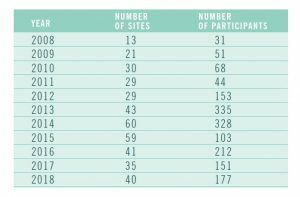 This year, Sunnyside was one of seven community sites served by Bring It Back to Normal volunteers. Jan Turner and Linnea Schultz plant trees during Bring It Back to Normal at the Bloomington garden that Turner’s daughter started . When I arrived at the garden, about 10 students were hauling soil and mulch and creating an orchard. I had just missed Connelly, but her mother, Jan Turner, explained the garden’s mission. She was impressed with the students. They had planted more than 70 fruit trees—apple, apricot, cherry, and pear—that morning. The garden’s own volunteers had been able to put only six in the ground one day earlier that spring. The students also bedded plots of asparagus, beets, lettuce, kale, mustard, potatoes, and tomatoes. Freshmen Linnea Schultz, a member of Illinois State’s Quidditch Club, and Chad Van Meter helped Turner with the orchard. They didn’t seem to mind the cold and muddy conditions. “I’m really passionate about helping my community,” Schultz said. The seven students had painted, mulched, raked, and cleaned for two hours. They were happy to help Hobson, noting how they were nothing like the stereotypical frat bros portrayed in the media. “It’s nice to give back, honestly,” said Harris Plofsky, who graduated last May with a degree in marketing analytics. Hobson, who is in her 70s, praised the students as they left. “These guys have been wonderful helping me. A long morning’s work complete, it was almost 12:30 p.m. and time for a shower. The next Bring It Back to Normal is scheduled for April 2019. Residents and community organizations can sign up as volunteer sites between mid-February and mid-March. Student volunteer registration runs from March until a few days before the event. For more information, visit CommunityEngagement.IllinoisState.edu/Students/Community-Service/Bring-It-Back-To-Normal.